It's becoming harder and harder for me to restrain my ambitions at my Meatwaves. When I look back to my earlier days, I would pick three, maybe four, recipes to try out, resulting in manageable menus. I think it was when I decided to scale back my barbecues from every other week to once a month, that I changed and felt the need to cook all my ideas all the time, which has translated to me developing six to eight recipes each time, requiring a lot more work in both prep and cooking. I often feel rushed and totally consumed with grilling on Meatwave days, leaving less time for hanging out with my friends—a critical part of why I throw these cookouts in the first place. 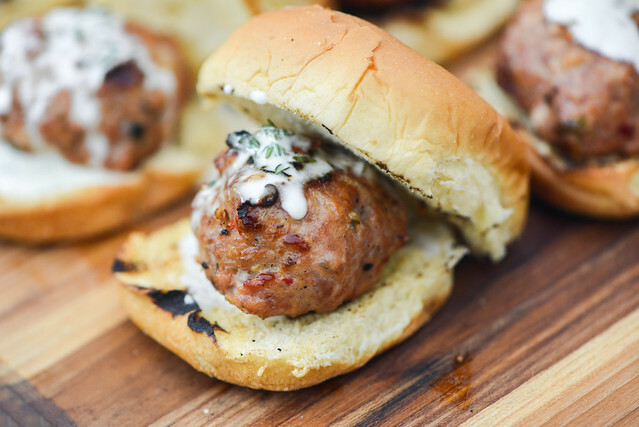 So when creating a menu for a meatball themed Meatwave last year, I actually came up with a ton of recipe ideas, and it took a lot of discipline to only choose four and stick to them so I could have a good balance in my day. 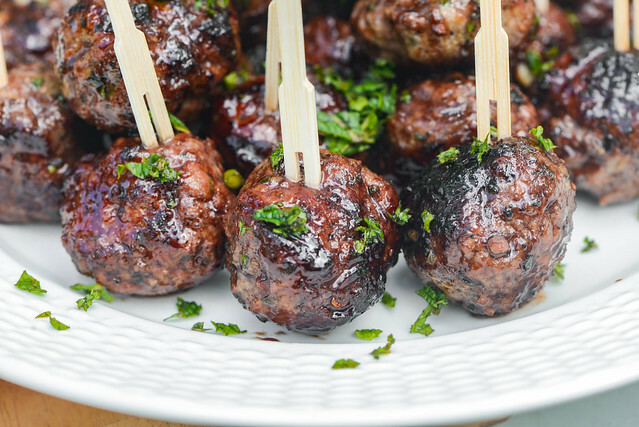 That left me with a number of additional recipe ideas for me to fit into future menus, and I finally got to one of those recently...these lamb meatballs with a pomegranate glaze. Italian meatballs were the mother of all my meatball grilling efforts. That initial recipe was so good and successful, I've made meatballs a constant theme throughout the years, and while I've developed some other greats, I often return to that original Italian inspiration source. 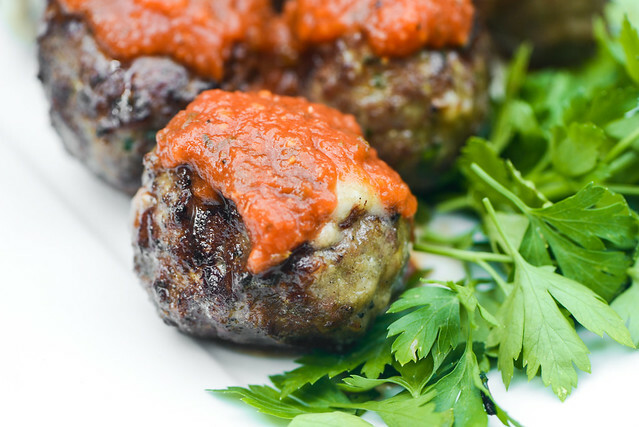 While I'm happy that I have a recipe that works over and over again, I had the idea to take these meatballs to the next level recently and stuff them with cheese, which ended up being an exercise in making an already good thing even better. I keep a Google Doc of recipe ideas where I can quickly jot down thoughts during moments of inspiration, which I then organize into themed Meatwaves as the list grows. 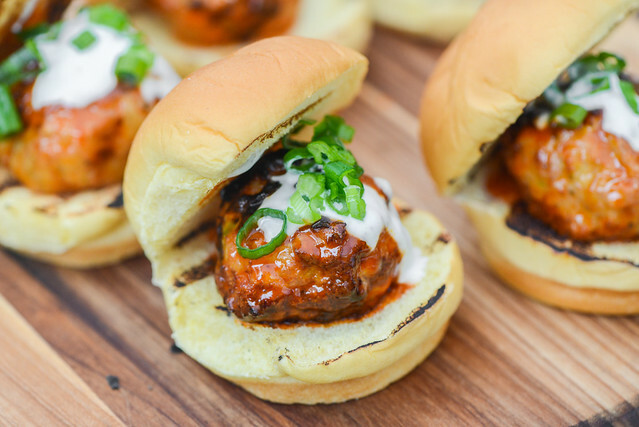 For as long as that document has existed, Buffalo chicken meatballs has been on it. It's something I've had a hankering to do for a very long time, but it's also well treaded territory around other food blogs and I've let that fact influence my decision not to make them in and effort to be somewhat innovative and not another platform for repetition. I finally just said screw it though, and during a meatball-themed Meatwave, Buffalo chicken meatballs seemed too good not to make, and the only thing I regret is not doing them sooner. In the days leading up to a Meatwave, I try to keep my schedule light in order to have enough time to prep for what is usually a fairly labor intensive task. Time was something I didn't have though before Meatball Mania! a couple months ago because my wife and I were hosting a couple of out of town guests and showing them a good time around Durham was top priority. So I was on a hunt for meatball creations that required very minimal effort, and in searching for a recipe for one of my favorite meatballs from my days in New York—the spicy pork meatballs from The Meatball Shop—I found out it was not much more than hot cherry peppers and ground pork. So that quick and easy recipe seemed to fit the bill perfectly and it made the cut for that quick-to-prepare Meatwave. So I did the barbecue competition thing, and while it was tons of fun, it was also expensive (unless you're winning a lot), exhausting, and ate into vacation days. I learned a lot in the couple summers I cooked competitively, but ultimately decided to focus my efforts more on home cooking. This year I'm having a hankering to get back into competitions again though. One reason is it'll just be a whole lot easier out of North Carolina—no more dragging smokers down stairs or pulling canopies out of a storage unit—and I also have something I was missing previously, friends who can easily join up for the fun (a lack of cars was a persistent issue in New York). Pondering re-upping in competition brought thoughts MOINK balls back into my mind. 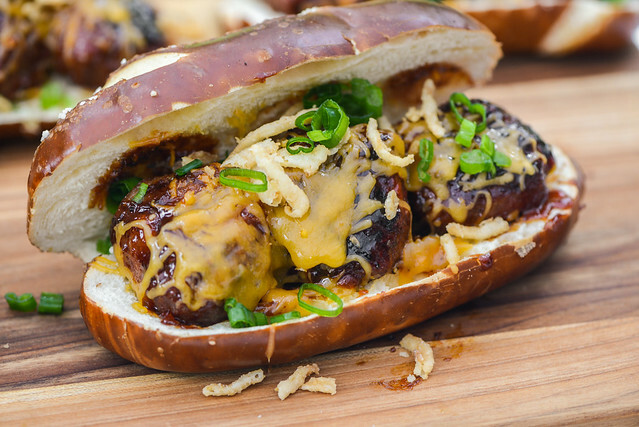 These beef meatballs wrapped in bacon are a pitmaster favorite and can be a common snack around competitions, and for all the times I've had them, I realized I had never seen them in sandwich form, so jumped on the idea to create these MOINK ball heroes.